Outdoor chemical storage lockers meet EPA, OSHA & NFPA regulations and FM or Warnock Hersey approvals. Safely storing hazardous materials, agrochemicals, chemical drums or waste materials is critical to the success of many companies. Outdoor chemical storage lockers provide a safe solution for storing dangerous materials that are used in daily business operations. If storing flammable or combustible materials, you will need a fire-rated or non-combustible outdoor chemical storage locker. 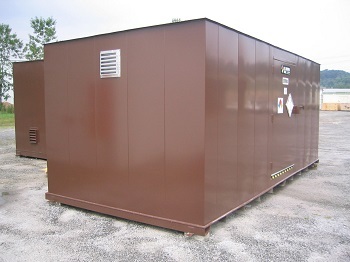 Non-combustible outdoor chemical storage lockers are constructed with non-combustible heavy-gauge steel. Whereas, fire-rated lockers are constructed from heavy-gauge steel and include a fire-resistant insulation in the walls. Safely store drums, pallets, totes and other containers safely with an outdoor chemical storage locker. See below for regulated fire-separation distances. The type of chemical storage locker selected will determine the appropriate proximity to occupied facilities and property lines. The International Building Code specifies minimum distances, illustrated below. Check with your local Fire Marshall to determine accurate fire separation distances, based on geographical location. A variety of accessories are available to meet safety and compliance requirements, when storing hazardous materials. Accessories include mechanical or natural ventilation, dry chemical fire suppression, heating and cooling systems, shelving, explosion relief constructions, electrical components, lighting and more. Accessories can be used to increase safety for workers or can simply be used for creating an efficient chemical storage atmosphere. What is a sump or a secondary containment system? A sump is a reservoir that serves as a drain or receptacle for liquids. Outdoor chemical storage lockers feature a leak-proof secondary containment sump to prevent any hazardous situations that might occur from accidental spills or leaks. The sump is covered by a steel or fiberglass floor grating, which is an elevated, non-slip flooring system. To learn more about outdoor chemical storage lockers or how to keep hazardous material safe and compliant visit us online or call 888-294-2729 for a free chemical storage consultation.